Doesn’t get much easier than this. 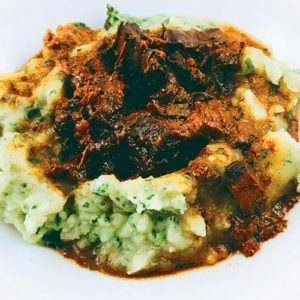 It can be done in the slow cooker (the ultimate easy), or in the oven for a few hours (easy but does require you to be home, so more of a weekend dish). It’s a British beef stew, which originates from Nigella in Simply Nigella, and slightly tweaked by me. Honestly my biggest headache is going to the butcher and trying to translate what I need into French. It’s the one place I can’t seem to get my point across and I almost always walk out with something other than what I was looking for. The original recipe calls for boneless beef shin. I gave the butcher a direct translation and he looked at me like I was the strangest customer he had ever served. If anyone can make a translation and send it to me I’ll give you a million dollars. Put the beef and prunes together in your slow cooker. In a bowl, mix the stock, Guinness, molasses, and salt. Pour over the beef and prunes in the slow cooker. Add the cinnamon and bay leaves, and turn it onto low for 8 hours. That's it! You can eat this for several days after cooking, and it only gets better with age. If you prefer to cook it in the oven, put it in a cast iron pan with a lid, into a pre-heated over at 150c, and cook for 2-3 hours. Add a bit of water if the sauce gets dry (you won't have this problem with the slow cooker). You can serve this with whatever you want, crusty bread, rice, buttered noodles, or potatoes. 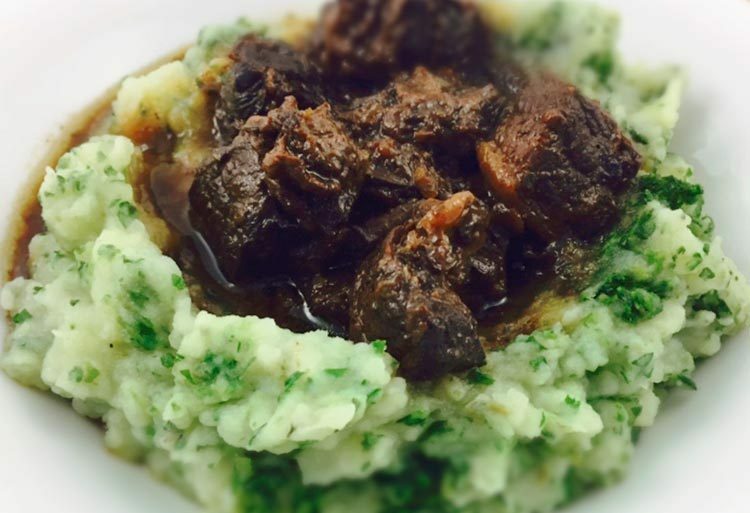 Here in the picture it's made with mashed potato and spinach puree. Peel and chop 6 potatoes, put into a pan and just cover with water. Cook on high with the lid on until the potatoes are tender (timing depends entirely on the size of your cubes). When tender, reserve some of the cooking liquid, and blitz the potatoes with a hand blender. Add alternately splashes of milk and splashes of cooking water until you get the consistency you like, and then mix in a handful of frozen spinach. Stir until warmed through and combined. It looks really pretty with those potatoes. Perfect for Saint Patrick’s Day.